The RF-8, or GAZ-98, was an aerosan used by the Soviet Union during the Second World War. The GAZ-98K was a version with a more powerful GAZ M-11 110-hp aviation engine in place of the standard automotive engine. 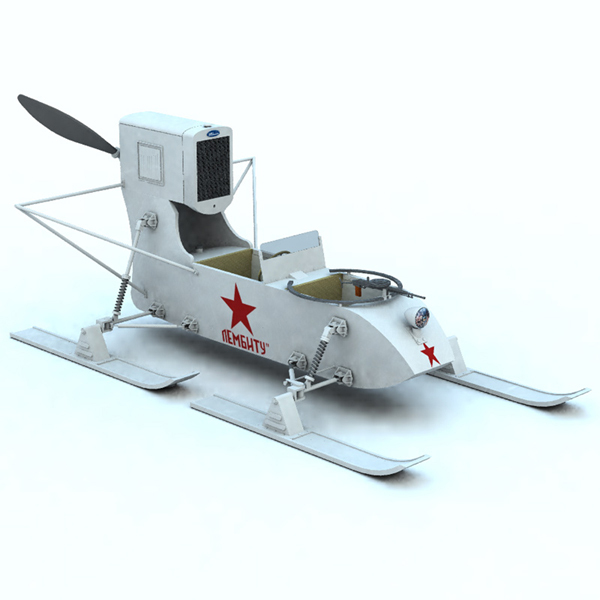 An aerosan (Russian: aerosani, literally `aerosled`) is a type of propeller-powered snowmobile, running on skis, used for communications, mail deliveries, medical aid, emergency recovery and border patrolling in northern Russia, as well as for recreation. Aerosans were used by the Soviet Red Army during the Winter War and the Second World War. The first aerosans may have been built by young Igor Sikorsky in 1909�10, before he built multi-engine airplanes and helicopters. Military use of the aerosan goes back to at least the 1920s. During the 1939�40 Winter War against Finland, some were equipped with a machine-gun ring mount on the roof. They could carry four to five men, and tow four more on skis. The aerosans were initially used for transport, liaison, and medical evacuation in deep snow, and mostly used in open country and on frozen lakes and rivers because of their poor hill-climbing ability and limited maneuverability on winding forest roads. During WWII, aerosans were found to be useful for reconnaissance and light raiding in northern areas, thanks to their high mobility in deep snow (25�35 km/h, where many vehicles couldn`t move at all). Responsibility for aerosans was transferred to the Soviet Armoured Forces (GABTU) and orders were submitted for design and fabrication of lightly-armoured versions, protected by ten millimetres of steel plate on front. They were organized into transport or combat battalions of 45 vehicles, in three companies, often employed in co-operation with ski infantry. Troops were usually carried or towed by transport aerosans, while fire support was provided by the heavier machine gun-armed, armoured models. Aerosans were not used for direct assault because of their vulnerability to explosives such as mortar rounds.